Slip and fall on something that has been spilt on the floor of the store, suffer an injury as a result and you may be entitled to an award of compensation. The background: The appellant, Ms Strong, was injured when she slipped and fell while walking in the Centro Taree Shopping Centre. The accident occurred in an area outside the entrance to Big W, a store owed and controlled by Woolworths Limited. The appellant was disabled and walked with the the aid of crutches. As she was walking towards the entrance to Big W the tip of her crutch came into contact with a greasy chip that was lying on the floor. She slipped and fell heavily, resulting in a serious injury. The outcome: In the initial case against Woolworths, the District court found in favour of Ms. Strong. Woolworths, however, appealed and succeeded in having the District Court judgement dismissed on the basis that they had failed to prove that Woolworths’ negligence was a cause of her injury. The difficulty with her case against Woolworths was that there was no evidence as to exactly how long the chip had been on the floor. She appealed the decision of the Court of appeal in the High Court and was successful. 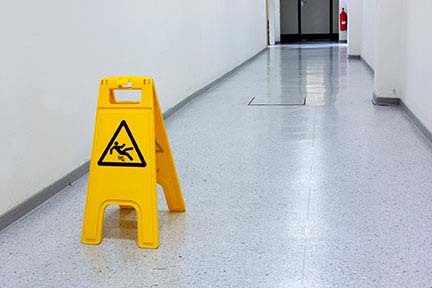 Points to note: The High Court case concerned Ms. Strong having to overcome the familiar obstacle in slip and fall cases of establishing a causal link between the lack of a sufficient cleaning system and the injury suffered by the person, when it is not known when the slippery substance was dropped. The appellant, Ms. Strong, was required to prove on the balance of probabilities that Woolworths’ negligence was a necessary condition of her harm. Woolworths’ negligence was its failure to maintain a proper system for the inspection and cleaning of spillages in the sales area outside the entrance to its store. Ms. Strong was required to prove that, had a system of periodic inspection and cleaning of the sales area been in place on the day of her fall, it was likely that the chip would have been detected and removed before she approached the entrance to Big W.
The court found that had the area been inspected the chip would have been detected and removed. Given that the area had not been inspected in the 4½ hours between the opening of the store for trading and the time of the appellant’s fall, negligence was proved. There are many ways to be successful in a “slip and fall” accident, and Henry Carus and Associates can assist with specialist legal advice. If you have been in a ‘slip and fall’ accident and are unsure whether you can make a claim, please feel free to call us on and we will be happy to advise. All of our work is done on a “no win, no fee” basis, guaranteeing that you do not pay any fees until we have won your case.